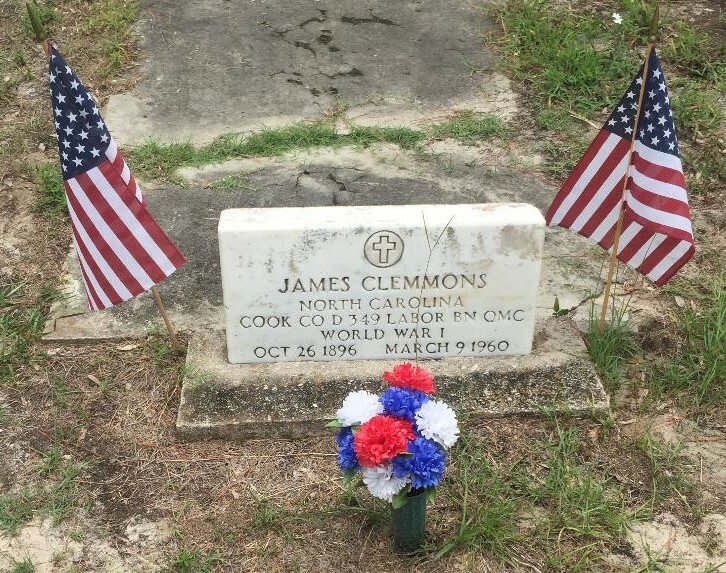 August | 2018 | Friends of Fort Caswell Rifle Range, Inc.
To view this or an earlier profile at any time, click on the veteran’s name on the WWI Brunswick County Veteran list, which is also accessible by the blue button on the top right of the webpage. 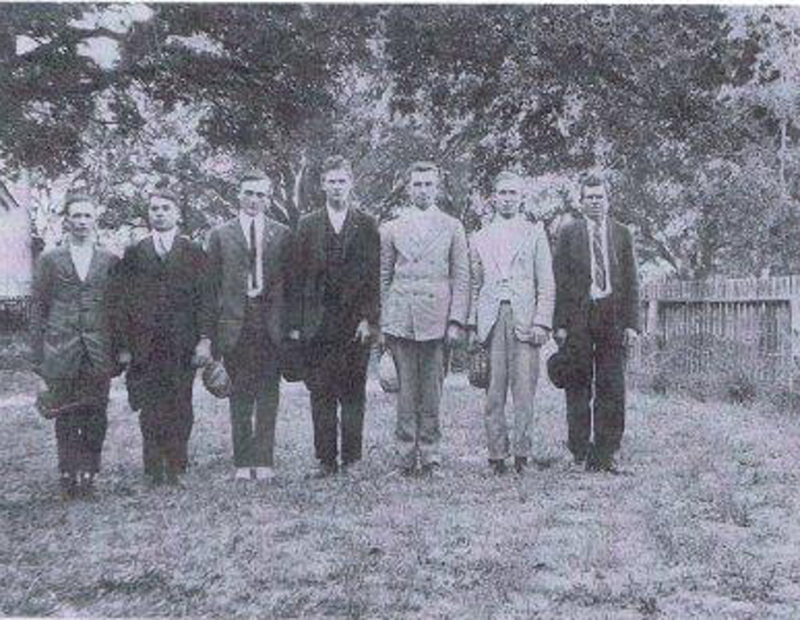 Henry Lindon Clemmons (center) is shown with the six other men from Brunswick County ordered to report for duty on October 15, 1917. Beside him (order unknown) are Luther J. Inman, Owen R. Mintz, Willie H. Hewett, Robert W. Holden, Mack Leonard, and Isaac Fred Edge. Willie Hasper Hewett was born and raised in Brunswick County, NC. His family tree is located in FamilySearch. Willie served as a bugler. 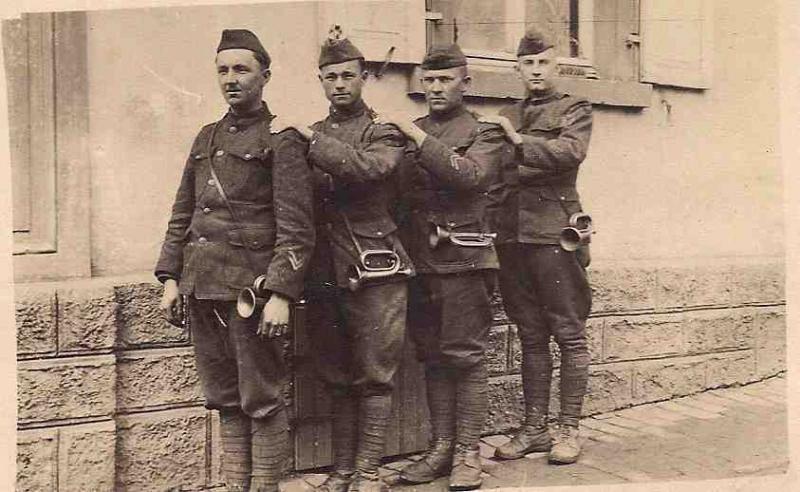 The previous WWI Profile of Bugler William Ralph Smith included details and pictures of buglers and their dangerous mission communicating orders to the troops. Brunswick County had four known buglers; all served overseas. Two were wounded. From previous posts, the 81st Division had completed their operations at the St. Die sector, then left on October 19, 1918 at 2:30 am. They hiked 50 km in two days with full packs, then rested and trained for their entrance in the Meuse-Argonne offensive. Passing through St. Mihiel gave the division their first view of the destruction in France. Reading the entries in the diary of Thomas Shinn helps us understand their experience as they marched through the countryside. We passed through St. Mihiel which was once a beautiful city but now hardly a stone was left unmoved. Churches and school buildings were piled up as a whirlwind piles up loose sand in March. Great steel manufacturing plants looked as tho’ a flood had struck them. Great fields which had once supplied France with grain are now covered in barbed wire and shell craters. Great forests which would have supplied France with wood to burn and lumber to build were [illegible] down as a mower cuts his hay. The closer they moved to the front, the more detailed the diary entries became. Eight o’clock caught us hiking again. It was a long hard hike and we didn’t have much to eat. We were entertained in the day time by air battles between planes, at night by the flash of guns and the pretty colored flares that signify orders for the artillery. I went 6 weeks without pulling off my clothes and 35 days without pulling off my shoes and had cooties on me at the same time but that’s not a disgrace for every soldier has them on the front. He doesn’t have time to think of clothes baths beds or how deep the mud is but he only wonders how he can save his skin and kill the Hun. They arrived in Verdun, a town that was previously home to 25,000 but was now “torn to pieces, not a wall was left standing.” The 81st Division was to relieve the 35th Division. At 10pm, they were called to move into the reserve trenches. Called the “Underground city of Verdun” it had never been taken by the Germans. The top of the ground was a solid mass of human and horse bones. It is said that more than 700,000 bodies are buried on this hill. I looked upon the skeletons of many horses and men buried together and had been blown up by the big shells that are still coming over. In so many cases a ring or any metal thing that the man had in his pocket still lay there and by the bones of horses still lay parts of the saddle and the bridle bits between his teeth. We are getting used to cooties by this time. The only thing I was scared of in the dugout was rats. We had some there as big as common house cats. On November 8, orders were received to attack early the next morning. They were to take a line from Fresnes-en-Woevre to Parfrondrupt, the infantry in positions from right to left: 324th, 323rd, 322nd, and 321st. The attack was to be directed toward the road. This was the first time the 81st Division would go over the top. The 322nd and 324th Infantries would lead the way, with the other two in reserve. In those three days fighting, there were 178 killed, nearly 800 wounded, 57 captured, and 6 missing. 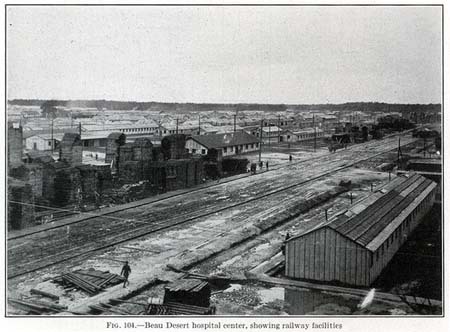 On December 8, 1918, he left Beau Desert, a 550 acre hospital about 5 miles west of Bordeaux. Bugler Willie Hewett was honorably discharged on January 26, 1919. He had no reported disability. Willie was married in January 1920. The 1920 Census shows he and his wife were living in Southport, rooming with a John C. Fulbright and his wife. John Fulbright was from Louisiana and served at Jackson Barracks, Louisiana, during the war, re-enlisting afterward. The census shows Willie Hewett as also continuing to serve with the US Army. Willie’s military headstone application [Source: ancestry.com] shows he re-enlisted on October 1, 1919, with an honorable discharge on October 19, 1920. 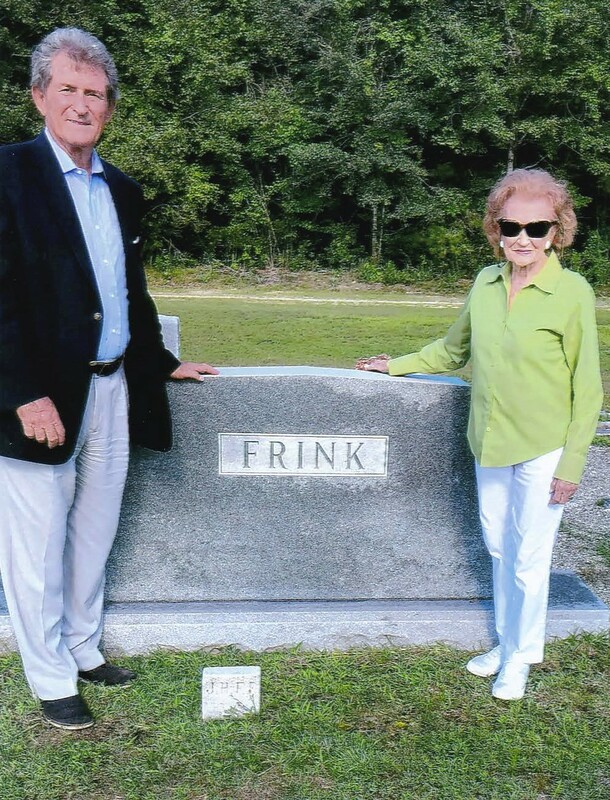 He and his wife raised several children in Brunswick County. Willie Hasper Hewett passed away on May 22, 1962 at age 66. He had spent the previous 4 years in a nursing home. He was laid to rest in Gurganus Cemetery in Shallotte. 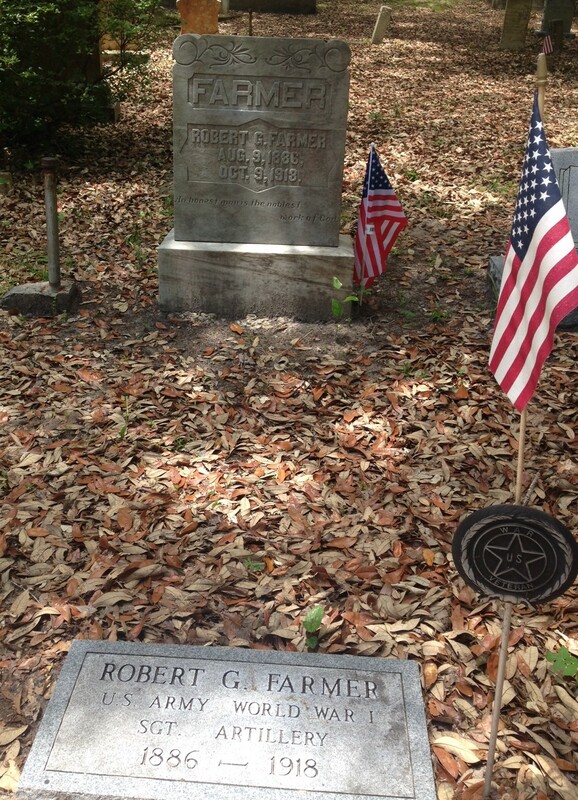 A military marble headstone was approved and shipped but it is not shown in findagrave. Johnson, Clarence Walton (1919) The history of the 321st infantry, with a brief historical sketch of the 80th division, being a vivid and authentic account of the life and experiences of American soldiers in France, while they trained, worked, and fought to help win the world war. . Columbia, S.C., The R. L. Bryan co.
Click here or the NEWS selection at the top of the website to see the many stories in the media about the rifle range and Honor a Brunswick County WWI Veteran project. As always, The Friends of Fort Caswell Rifle Range appreciates the support of the local media! William Ralph Smith was born and raised in Johnston County, NC. 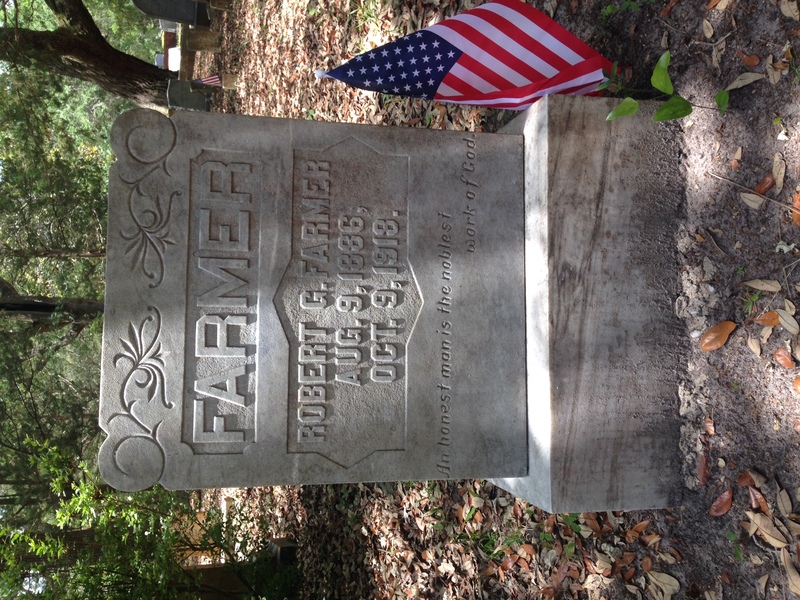 His brother, Robert F Smith, also served in WWI. Some time between the 1900 Census and the 1910 Census, his mother passed away. The 1910 Census lists William and all of his brothers and sisters as laborers on the family farm in Johnston County. William’s WWI Draft Registration (June 5, 1917) shows he was living in Johnston County, single, and working as a barber. He also reported that he had experience in the NC Militia, 2nd Regiment, for 6 months. Mr. Britton Smith, of Bolivia, N.C., was in town Sunday and Monday. Mr. Smith has been appointed Postmaster of Bolivia and expects to move his family down there soon. By the time William was ordered to report for military duty and was inducted on September 21, 1917, his residence was Bolivia. 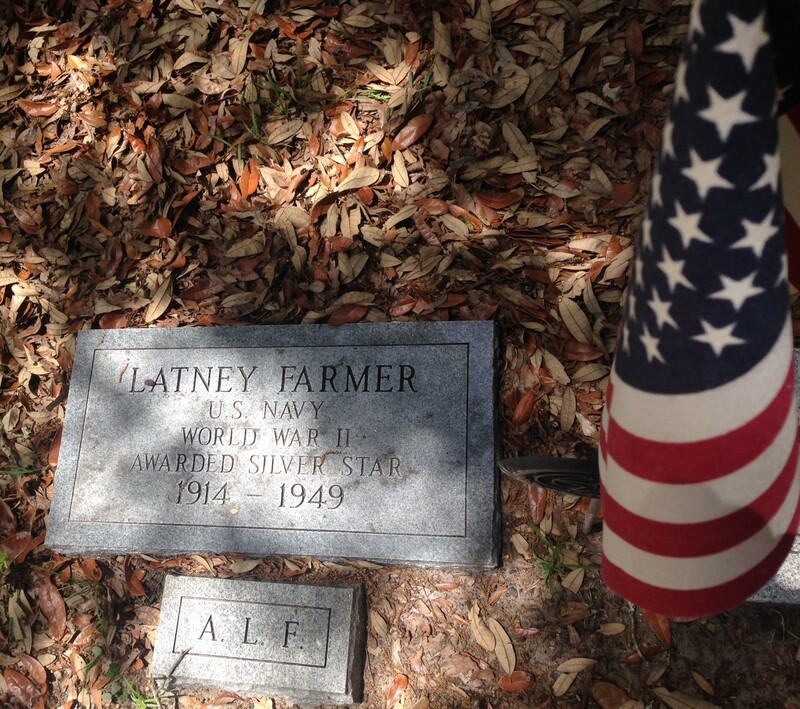 He became a bugler with Machine Gun Company, 322nd Infantry, 81st “Wildcat” Division. The bugler had a hazardous position. 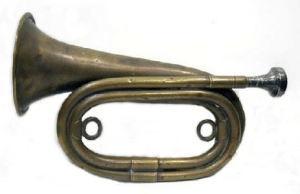 Telephone and telegraph lines were useless when trenches were abandoned, so the bugle became an important method of communication. To sound the bugle, the bugler’s gas mask was removed, risking poisoning and death during gas attacks. Continuing from the previous WWI Profile, the 81st Division completed training at Camp Sevier, and began the train trip to NYC, boarding the ships on July 31, 1918. Bugler Smith’s ship was Orduna [Source: ancestry.com]. In England, the Red Cross provided postcards to send to loved ones, notifying them of their safe arrival in Europe. Pictured is an original postcard from the NC Archives. Women did the work at the railroad, breaking, switching and even track work. Arriving at St. Die near the end of September, they were to relieve the 92nd “Buffalo Soldiers” Division. The 92nd Division included two Brunswick County men with WWI Profiles posted earlier, William James Gordon and Robert Stanley, as well as several other soldiers listed on the WWI Army/Marine Division Rosters webpage. After darkness fell on September 19th, they moved into the trenches that the Buffalo Soldiers had vacated. On September 22, after a German airplane flew directly above their heads, a sign appeared in no man’s land from the Germans, proving that their movements were being closely monitored. On October 15, 1918, at 9pm, they were relieved from their position in the trenches. Bugler Smith was wounded that day. 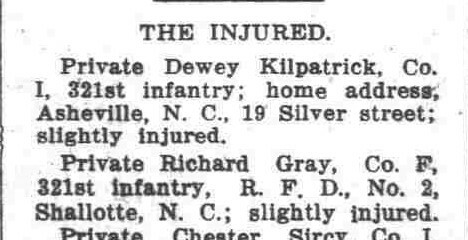 His NC WWI Service Card showed it was a slight wound, but it was a gunshot wound to the elbow, as indicated on the Passenger List below, and he was classified as having a disability at discharge. According to unit history, 14 men were wounded and 21 were killed during the occupation of the St. Die sector. Source: Ancestry.com. U.S., Army Transport Service, Passenger Lists, 1910-1939 [database on-line]. Lehi, UT, USA: Ancestry.com Operations, Inc., 2016. William Ralph Smith returned to the United States on January 31, 1919, and was honorably discharged on February 22, 1919, with a 15% disability. Recall the previous profile of Corporal Calmer Clemmons, which included a newspaper clipping that listed William Ralph Smith among the wounded returning to NC. The 1920 Census shows William (Ralph) was living with his father and two sisters in Town Creek. His father was still Postmaster and his sister, Patsy, was Assistant Postmaster. William was working as a barber. He married in 1922 and eventually moved to Wilmington, NC, and became a watchmaker. He and his wife raised several children. In 1929, William’s younger brother Robert, who also served in WWI died of meningitis and tuberculosis. He was only 35 years old and had never married. In 1936, his father Britton Smith died. The State Port Pilot, March 18, 1936, p. 6 published his obituary. Mr. Britton Smith, long-time resident and business man of Bolivia, died Thursday morning at James Walker Memorial hospital, after a lingering illness of pneumonia. Mr. Smith was 75 years of age. 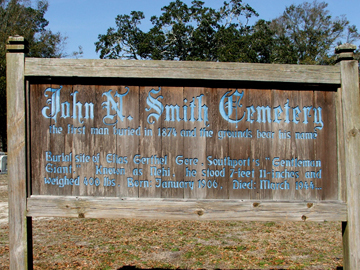 He was a native of Smithfield, Johnston County. Being an honest, straightforward christian man, he was greatly loved and highly esteemed among all of his friends and acquaintances. His wife preceded him in death several years ago. He leaves to mourn the loss three daughters, Mrs. Stancil, of Johnston County; Mrs. Fred Edwards of Bolivia; and Mrs. Thelma Pittman of Wilmington; also a son Ralph Smith of Wilmington, and several grandchildren. The funeral was conducted at 11:00 o’clock Friday at Smithfield by Rev. B.R. Page, assisted by local pastors. William Ralph Smith passed away in 1971 at age 80. 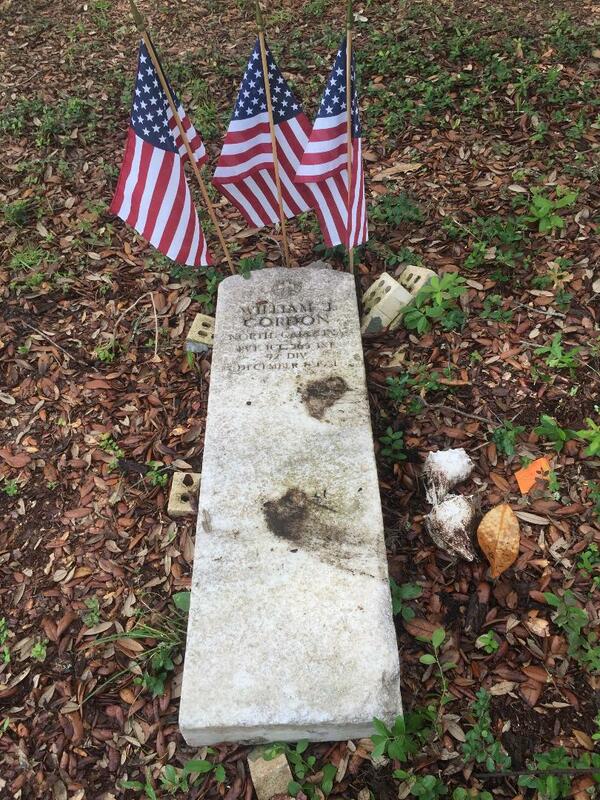 He was laid to rest in Oakdale Cemetery in Wilmington. Military honors are shown. The Friends of Fort Caswell Rifle Range received the following letter from a former resident of Caswell Dunes, along with a generous donation. He agreed to allow us to share his letter here. 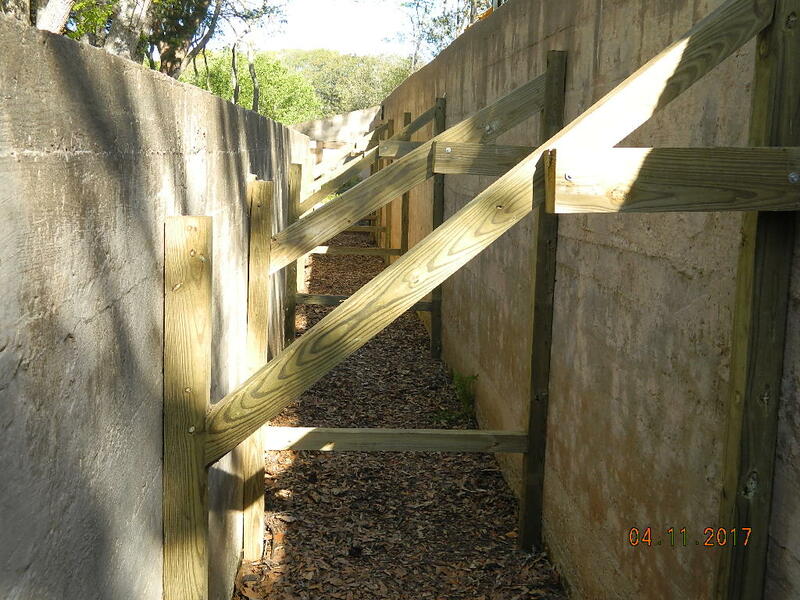 maintenance of the Fort Caswell Rifle Range. Here is a bit of history since I am one of the earliest residents of Caswell Dunes. The layout of Caswell Dunes was done without adequate exploration of the land because it was like a jungle and quite overgrown and thick with vines. Practically impenetrable. I purchased my condo by walking along the edge of the golf course with the realtor and simply pointing. They did not discover the rifle range until they started bulldozing, and had to inform the authorities, who didn’t know what it was, but said it had to be protected, and the builder had to move some buildings accordingly. My condo overlooked the rifle range and Bunker Rd. was so named because we called it the bunker back then and did not know it was a rifle range until much later when some research was done on the subject. I lived there from 1985 or 86 (can’t remember which) until around 1990. 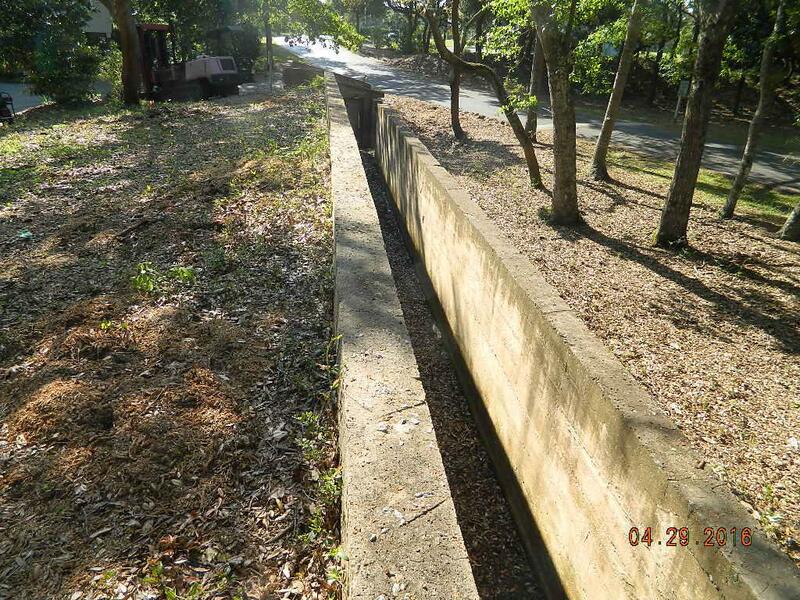 The bunker then was largely covered by thick jungle-like growth and not very visible. My gray cat lived on its walls and would pass the entire day completely protected, watching traffic drive by. When I arrived home in the evening the cat would run along the wall and greet me like a dog. He thought he was a dog and took walks with us on the golf course at night. 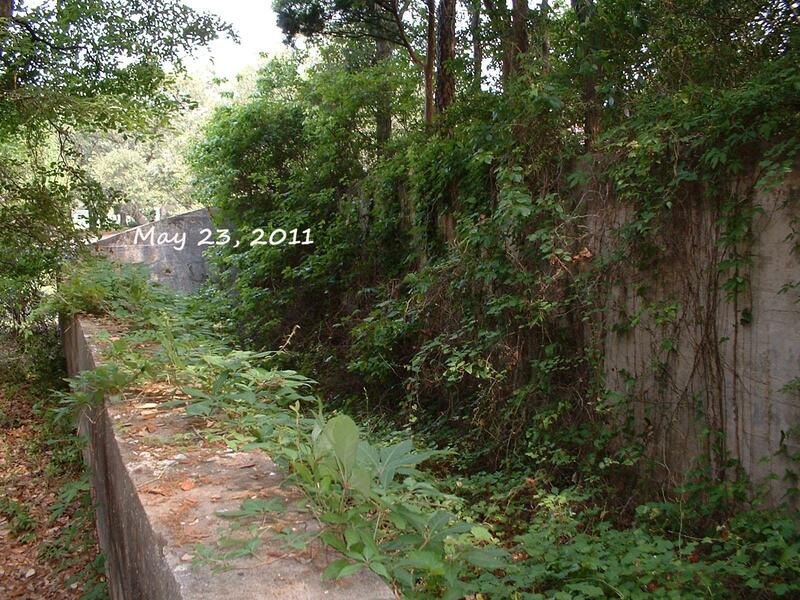 In those days children played on the walls and we planted shrubs and bushes around it. Consequently, it has always had a special place in my heart. 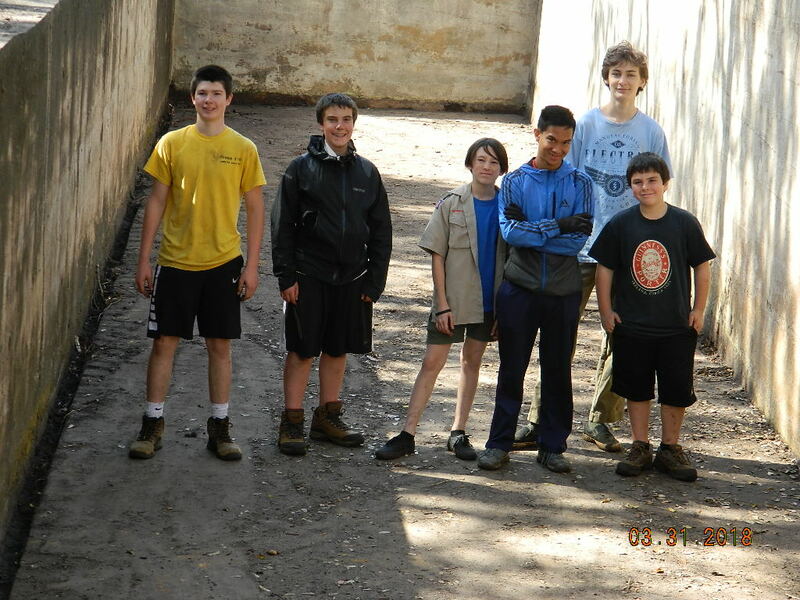 The earliest photo available is this photo from 2011. After many years, the current condition is quite different. 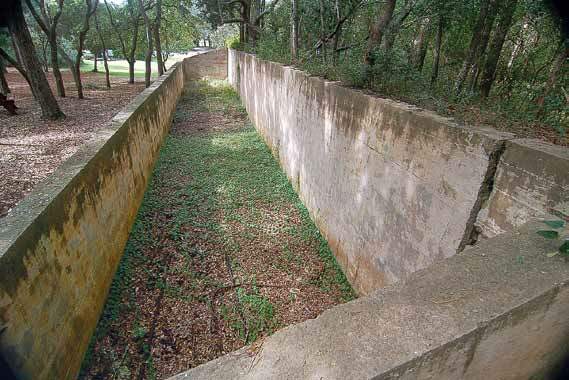 More significantly, the 1918 Fort Caswell Rifle Range is now a nationally designated WWI Centennial Memorial. 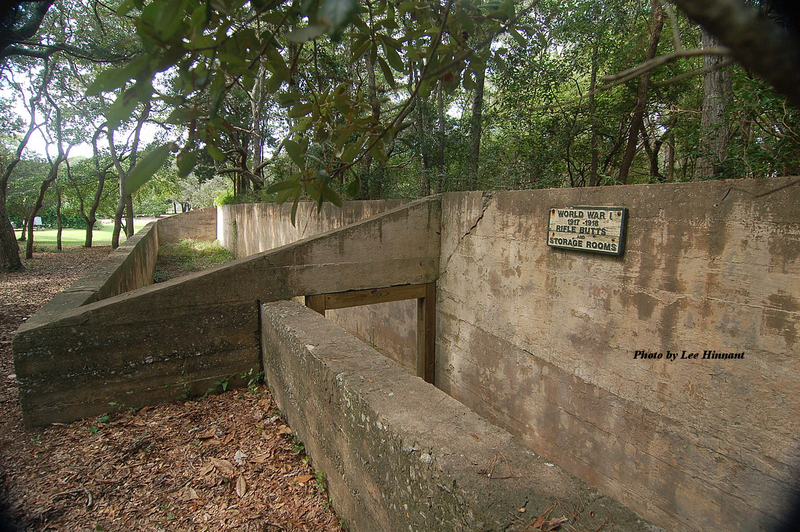 The Friends of Fort Caswell Rifle Range could not have accomplished the transformation to date without supporters like Henry Tonn. View all of the supporters and donors on the Contributors webpage. For more details on the previous seven years of the stabilization effort, see the Stabilization section of the website. Richard Herbert Gray was born, raised, and lived his life in Brunswick County, NC. A partial family tree is located in FamilySearch. Two of Richard’s brothers, Harvey Winfield Gray and Oscar Llewellyn Gray are also WWI veterans. Richard’s WWI Draft Registration shows he was single, living in Shallotte, and working in the logging industry. 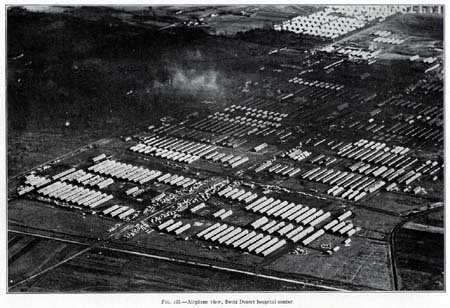 The 81st Division had just been organized in August 1917 at Camp Jackson. It was primarily created with those drafted such as Richard Gray. Another man who arrived that day was Thomas “Jack” Pinkney Shinn from Kannapolis, N.C. He wrote a diary rich in details and his impressions. Anyone wishing to understand the experiences of those in the 81st Division infantry regiments or just general front line experiences may want to read the 86 pages found at the link on his name. Excerpts will be included in the WWI Profiles for the 81st Division. Jack Shinn reached the level of 1st Sergeant while serving. When these first men arrived at Camp Jackson, only a small clearing had been made for some barracks. Those of us who came into camp during those first weeks spent almost as much time cutting trees, digging stumps, working roads and doing “landscape gardening” as in the study and practice of things purely military. We were naturally very slow in understanding what digging stumps and “policing up” cigarette “ducks” and match sticks had to do with winning the war. In October, about half of the men were transferred out of the 81st, mostly to the 30th “Old Hickory” Division. This transfer continued through the fall, winter, and spring of 1918. Those remaining in the 81st wondered if their division would become a depot division (training and receiving unit). This changed during May 11-18, 1918, when the division was moved to Camp Sevier and rapidly grew to war strength. But most were raw recruits, some having less than two week’s training. 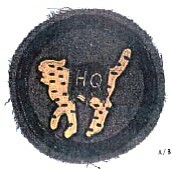 The first official divisional shoulder patches of the US Army. The 81st Division is officially known as the “Stonewall Division” but is popularly known as the “Wildcat Division.” The division adopted the wildcat insignia from the common wildcat of the Carolinas and Wildcat Creek that ran through Camp Jackson. The brigades, regiments, and specialty units adopted different colors for their patches. Shown to the right is the 81st Division headquarters shoulder insignia circa 1918. The Division Commander, Major General Charles J. Bailey, believed the insignia promoted division unity and raised morale. When the War Department ordered the removal of unauthorized patches from their uniforms, General Bailey took the matter to General Pershing. On October 19, 1918, Pershing directed each division commander to submit a sleeve insignia design for review and approval. 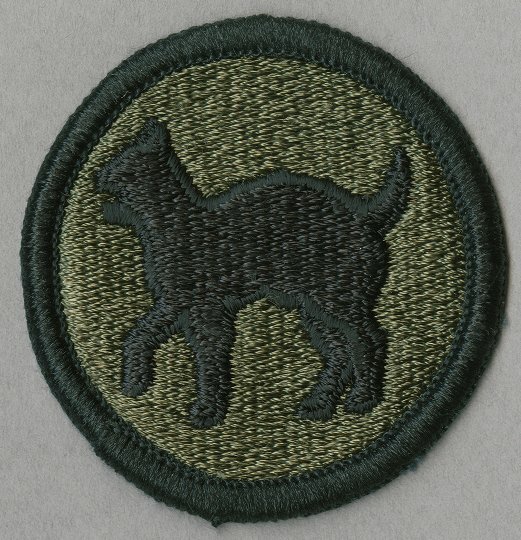 The 81st sent their design that day, obtaining approval, and becoming the first official divisional patch in the US Army. Before moving to Camp Sevier in May 1918, advance groups were sent ahead to prepare for the regiments. Pfc Richard Gray from Brunswick County was part of the advance group, as well as Pfc Jack Shinn. Pfc Shinn wrote this in his diary. I was ordered to take 6 privates and go to Camp Sevier to prepare for the Regiment that was to follow a week later. We loaded the train and started but our train was thrown from a tressell [sic] 45 ft. high. Nine men were killed and twenty-six wounded. The trip was postponed until the next day. Richard Gray was one of the wounded. His injuries would not have been known except for Jack Shinn’s diary in the NC Archives and researching further for details of the accident. Nine men were killed and they were reported as “Killed by Accident.” The men wounded seriously were reported as “Seriously Wounded” in their service records. But those injured slightly, as Richard Gray was, were never reported as wounded. The Wilmington Dispatch reported the deadly accident on the front page of the May 10, 1918 edition. At some point after this injury, Pfc Richard Gray was transferred to the Aux Remount Depot 310, Camp Sevier, breeding horses for cavalry. He remained there until he was honorably discharged on March 27, 1919. He returned to Shallotte after the war, where he raised a family. Richard Herbert Gray passed away on August 14, 1962. 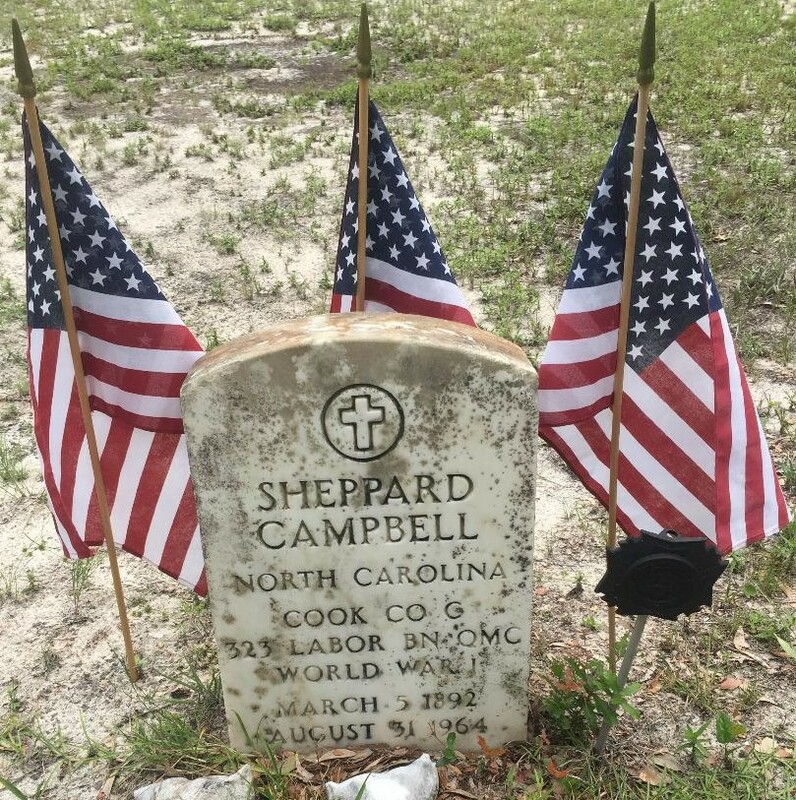 He and his brothers were laid to rest in Chapel Hill Cemetery in Shallotte. Click the category: Veteran Profile here or at the bottom of any veteran profile post to see all of the veteran profiles published. Follow or subscribe to the blog to stay updated on all new profiles. 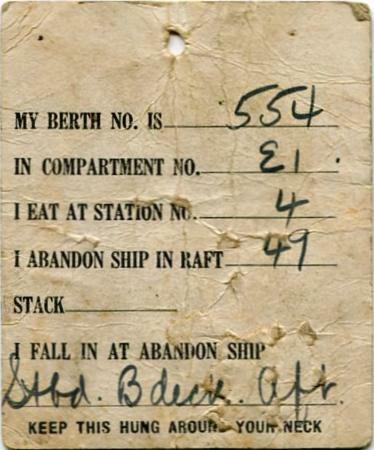 Martin’s NC WWI Service Card shows he served with the 322nd Infantry (81st Division) and was wounded on October 30, 1918. But while reading through combat history of the 81st Division, the regiments were resting before their big operation in early November. It seemed unlikely that Martin was wounded at that time. Pulling the passenger lists for transport to France [Source: ancestry.com] showed that he was not serving with the 81st. 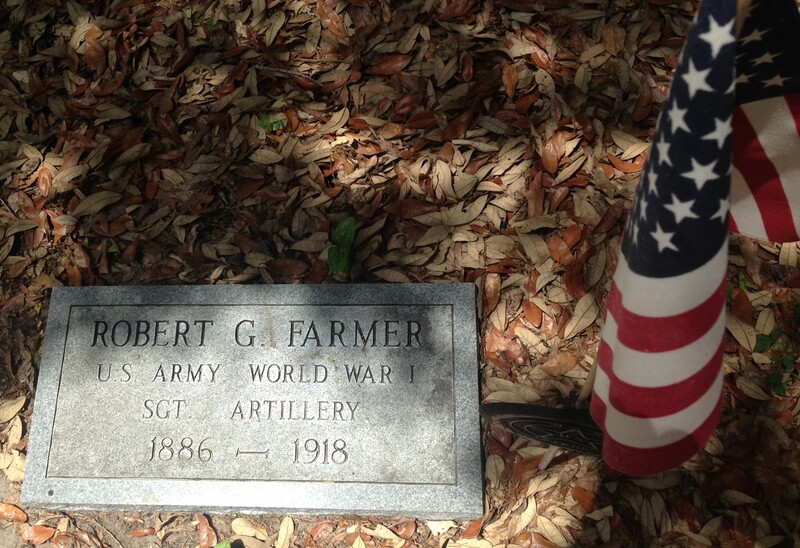 He actually served with the 113th Field Artillery of the 30th Division. He was included in the rosters in the historical documents written about the 113th. His injuries were documented also, as being gassed on October 29, 1918. Martin likely was originally training with the 81st Division. When he was ordered to report for military duty [Source: ancestry.com], he was sent to Columbia, SC, to Camp Jackson, which is where the 81st trained. As the WWI Profile posts about those serving with the 81st Division will show, the 81st Division had many men transferred to other units, mostly the 30th Division. Martin was likely transferred at some point, although it is unknown when. It’s fortunate that many documents exist to help verify mistakes on records, as well as add rich details to their experiences. 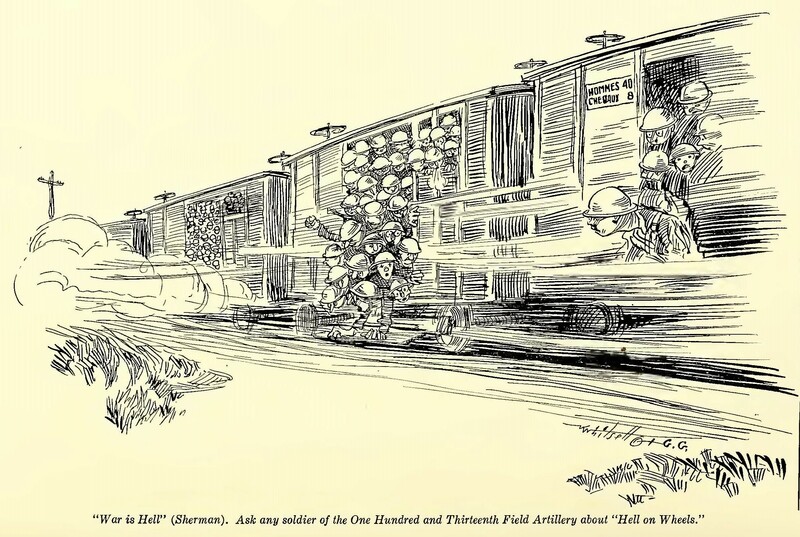 The 113th Field Artillery was well documented, as this profile will show. Martin Newman Mintz was born and raised in Brunswick County, NC. He was the eldest of four brothers, all serving in WWI. Forney Boston Mintz was the first to enlist in the US Army in 1913 at age 21. Half brother Samuel Leob Mintz enlisted in 1916; Martin and Owen Ransom Mintz were drafted. All four brothers served overseas. Martin, Forney and Owen were wounded. Leob and Forney made a career in the Army. Martin’s WWI Draft Registration shows he was living in Mill Branch, Brunswick County, single, and working on his own farm. 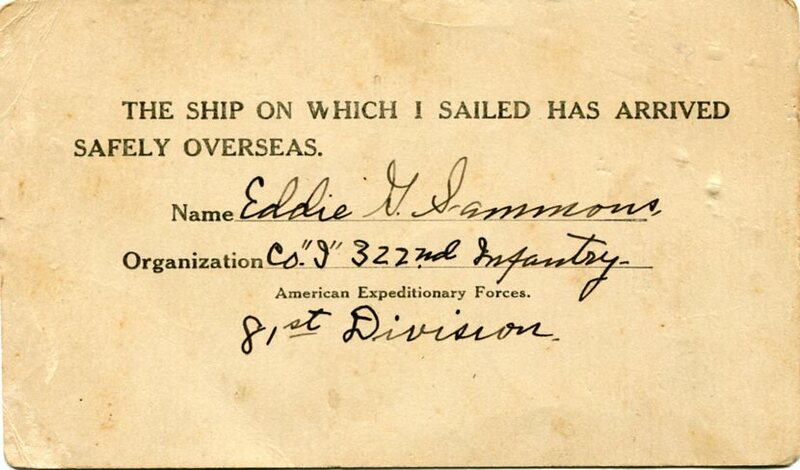 He was ordered to report for duty on September 18, 1917 [Source: ancestry.com] and accepted for duty on October 3, 1917. As mentioned above, he likely began training with the 81st Division, which was at Camp Jackson, SC. 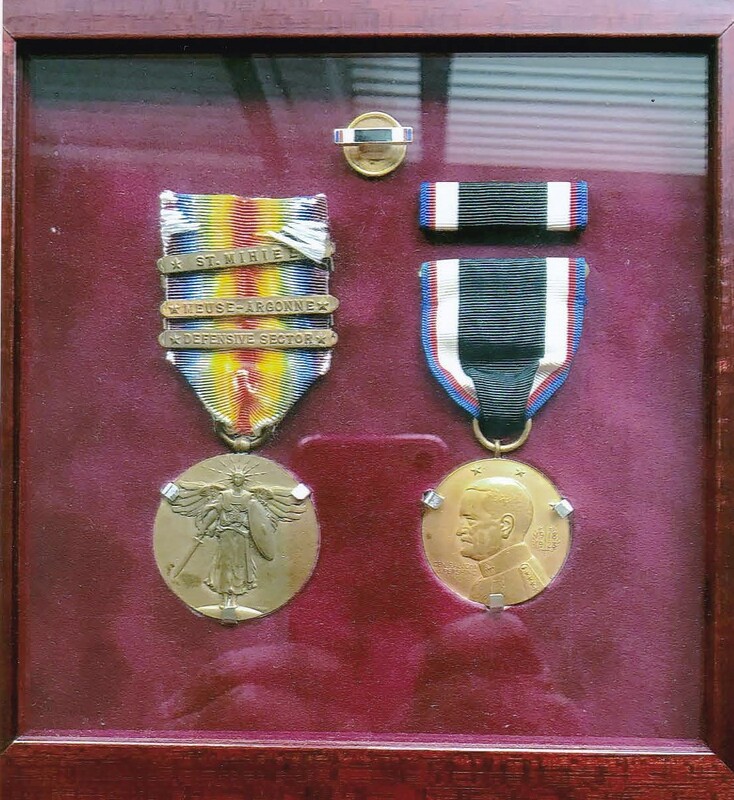 Because it is not known when he transferred to the 113th Field Artillery, his experiences cannot be described accurately until his name is listed on the transport record to France on May 27, 1918. Some background on the 113th Field Artillery of the 55th Artillery Brigade, 30th “Old Hickory” Division. The 113th Field Artillery was one regiment of the 55th Artillery Brigade. It included the following regiments. The tables list the Brunswick County men who served in them. There is a document which includes the 55th Artillery Brigade WWI experience and includes rosters and pictures of the men below. The following lists and references are available on the World War I Army/Marine Division Rosters webpage. Bacon, William James (1920) History of the Fifty-fifth Field Artillery Brigade … 1917, 1918, 1919 . Nashville : Benson Printing Co.
Fletcher, Arthur Lloyd (1920) History of the 113th Field Artillery, 30th Division . Raleigh, NC: History Committee of the 113th F. A. 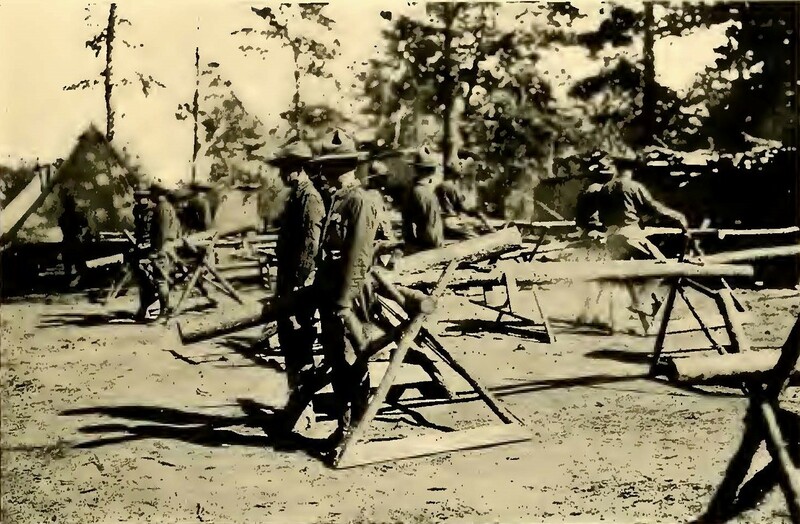 As previous posts about the 30th Division mentioned, they completed most of their training at Camp Sevier, SC. The land needed for field artillery training at Camp Sevier was almost completely cleared by the 113th using axes, saws, picks, and mattocks. Supplies were scarce and the winter of 1917-1918 was the worst winter the South had experienced since 1898 with terrible blizzards and high winds that ripped tents to shreds. Without winter clothing, training was difficult. The measles and mumps epidemic at the camp, which took the life of Brunswick County veteran Carl Jefferson Danford, added to the difficulties. The Supply Company, which included Wagoner James Varney Gore, was responsible for 1000 head of horses and mules, feeding, grooming, hauling bedding and manure daily, while also feeding and clothing the regiment: 7 days hard labor each week. Logs were used for training. Despite the 59th Artillery Brigade being part of the 30th Division, they never served at the front with them. The Allies felt there was enough artillery and requested infantry and machine gun outfits first. The 59th Artillery Brigade was left behind when the 30th Division left for France. In May, they finally made preparations for transport. Private Martin Mintz boarded the Armagh on May 27, 1918. The Armagh was a British freighter carrying beef from Australia and New Zealand and had been hastily converted into a transport, which made it an uncomfortable voyage. British food was served and was disagreeable to the men. When reaching the coast of Ireland, dirigibles, airplanes, and destroyers kept watch over the Americans. They were greeted in Liverpool with enthusiasm. After arriving in France, the 113th was overjoyed to have guns for all. 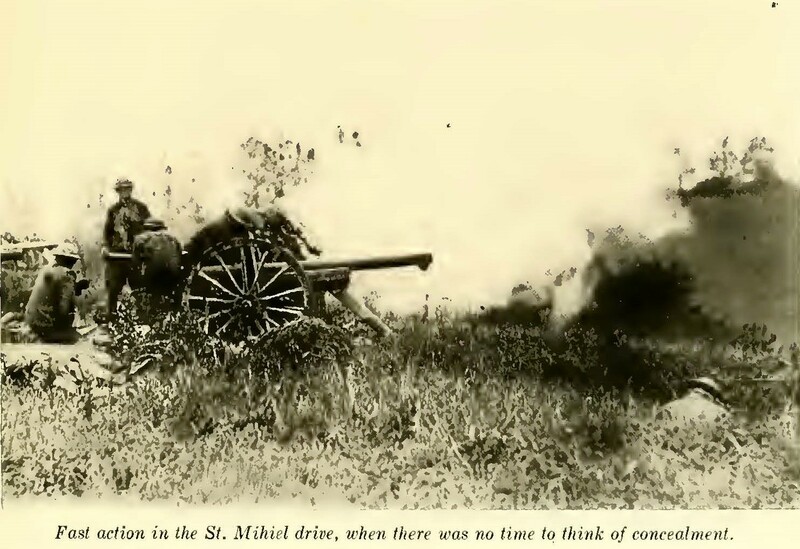 However, since the American 3″ gun was used for training, the men had to relearn everything to adjust to the French 75mm gun. In a few short weeks, they were ready for battle. The men hoped to rejoin the 30th Division, but were needed elsewhere. Their first taste of battle was during the Battle of St. Mihiel, supporting the 89th Division. This was typically a quiet sector where raw troops were seasoned. This was about the change. At 1am on September 12, 1918, the artillery began the barrage. The infantry were to come out of the trenches at 5am. In those four hours, the American guns fired more than 1 million rounds. When the infantry joined the battle, the artillery rolled a protective and offensive accompanying fire. 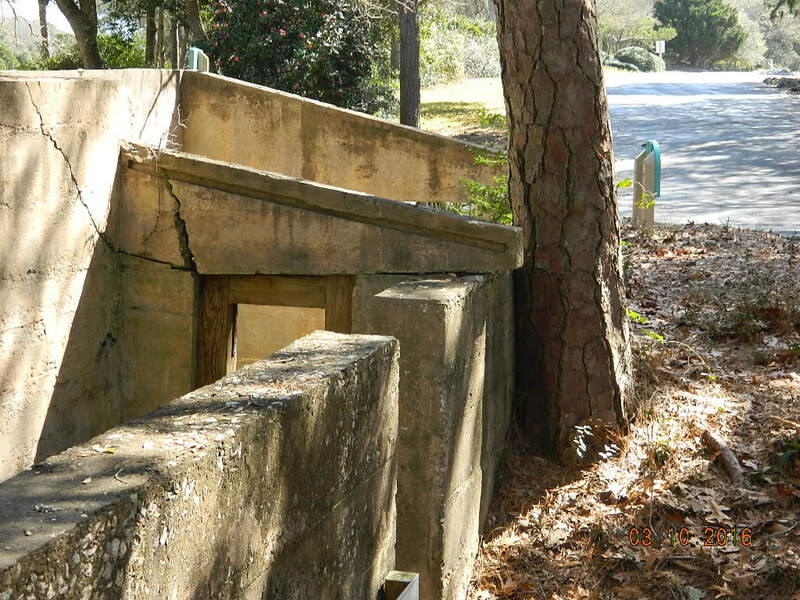 If the Doughboys could not take out a concrete machine gun nest, or “pill-box,” they called the artillery for assistance. Here was where the artilleryman found a task to his liking and up across the fields and through the woods on a dead run would come a gun section, the men clinging for dear life to the bouncing carriages and lying low over the necks of their horses. 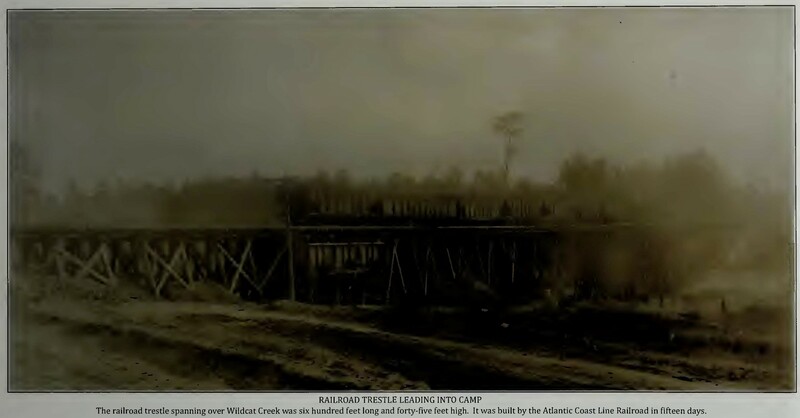 When deep trenches and wrecked roads and bridges would confront them in what had been No Man’s Land and in the territory back of the old German lines, the horses were unhitched from the carriages and led, pulled and shoved across, while willing hands seized the guns and caissons and carried them over places that looked to be impassable. There was no time to wait for the engineers to build roads and time and again on that memorable day the regiment did the impossible. 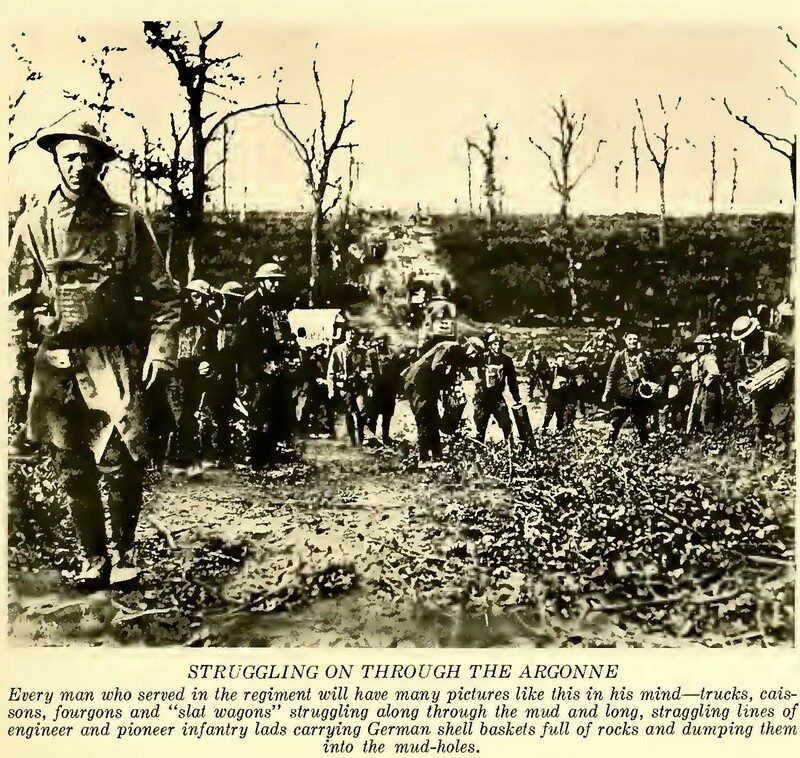 Because of the success at St. Mihiel, the Battle of the Argonne was prepared quickly. Typically, fighting didn’t occur at this time of year but waited until the end of winter. The Allies had chosen to take advantage of their momentum. On September 26, 1918, the 59th Brigade supported the 37th Division (Ohio) as the Doughboys began at 5am. The Germans were caught napping. German resistance stiffened the next day. The 37th Division was withdrawn on Sept. 30th, and the 32nd Division (Michigan and Wisconsin) relieved them. The 59th Artillery Brigade remained in position, this time with the 32nd Division. On October 6th, the 42nd Division relieved the 32nd. The 59th Artillery Brigade was prepared to remain in position yet again but they were ordered to withdraw. After two weeks of desperate fighting, followed close after a forced march and the St. Mihiel battle, their horses were depleted. They had entered the forest with 1050 horses and only 247 remained. The guns were no longer mobile and there were no horses to be had. They marched from October 9-12 to the Woevre Sector, SE of Verdun. “Join the Army and see the world” some soldiers would yell down the line. “Join the artillery and RIDE!” others would reply sarcastically. They were to rest and be re-equipped, but instead went into the line immediately, supporting the 79th Division until October 25th, then the 33rd Division (Illinois). The artillery was kept busy with harassing fire at night and protecting raiding parties. The Germans were doing the same, but with German regularity. Pvt Martin Mintz was gassed on October 29, 1918. His name was listed in the 113th Field Artillery regimental history book listed above. 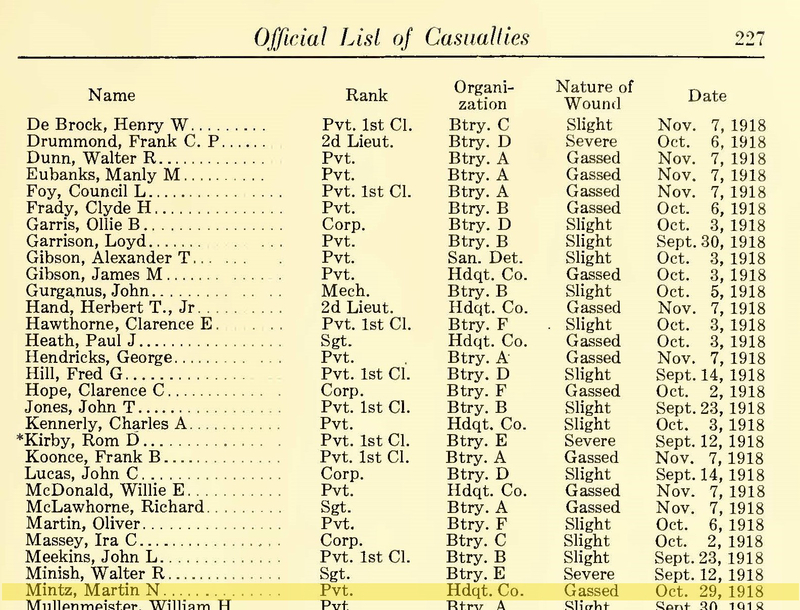 On the left is the page from the list of casualties that includes his name. There were many other men gassed at the time. He was sent home in December with the other sick and wounded and honorably discharged near the end of January, indicating that he required more medical attention upon his arrival. Martin Mintz returned to farming, married, and raised a family in Brunswick County. He passed away in 1975 at age 87. 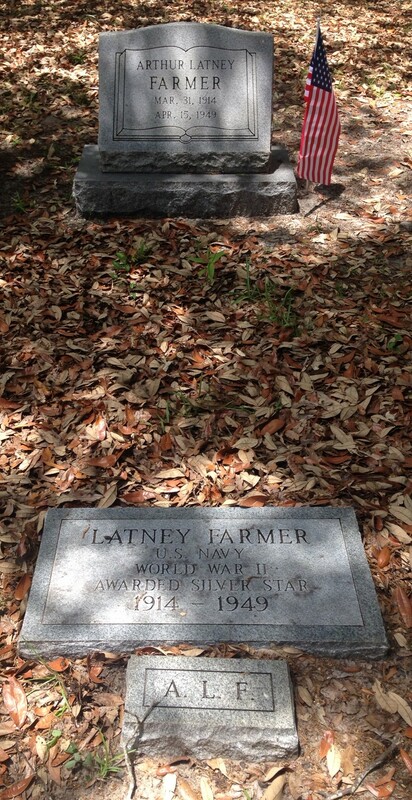 He was laid to rest in Mintz Cemetery in Ocean Isle Beach, NC. Military honors are shown. The 113th Field Artillery is credited with 67 days occupying active sectors and firing. Only 2 divisions (1st and 3rd) are officially credited with longer service in active sectors. The 59th Artillery Brigade served with the following American Divisions: 89th, 79th, 30th, 33rd, 37th, and 32nd.